How will this affect our gleaning activities? The pest is found on the leaves and stems of the trees, not the fruit. So we will still be able to harvest in the quarantined area, but absolutely no green matter can leave the harvest site… Short stems, no leaves, no branches. All pruners will be washed in a bleach solution after harvesting. More info can be found here. Thanks for helping us be cautious with this problem. The Asian Citrus Psyllid can carry a disease called Huanglongbing (HLB) that will kill citrus trees. There is no known cure for HLB, the health of the tree will continue to decline until it dies. Currently, in SLO County, the Asian Citrus Psyllid pest (which carries HLB) has been found in the area, but not the HLB disease. Let’s help keep it that way! This entry was posted in Produce Collection, Uncategorized on 04/16/2014 by gleanslo. Our experience with students has shown that the act of collecting fruit for distribution can be an extremely powerful experience, building empathy and connection between students and families in less fortunate circumstances. In addition, the process of sharing food grown in local areas intensifies neighborhood associations between students, their parents, school faculty and the immediate community. One or more banners reminding students and parents to bring in produce, to be hung during Fruit Week. 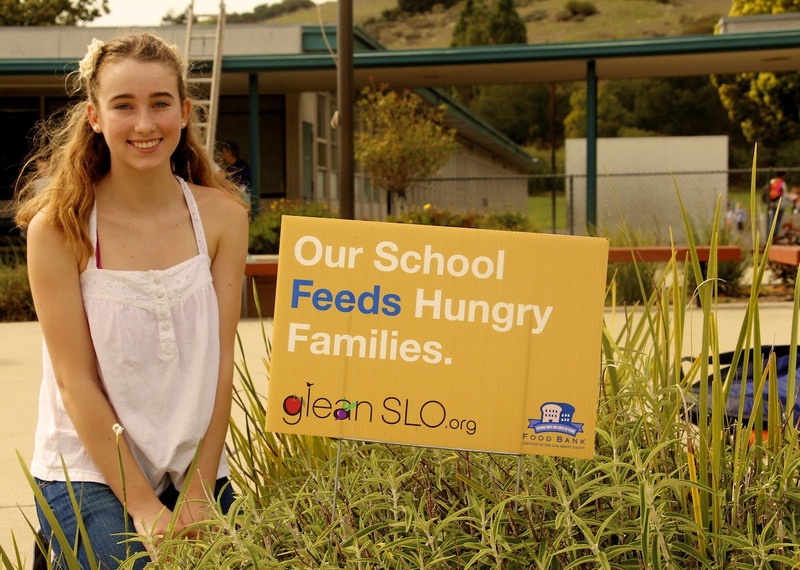 Two signs: “Our school feeds hungry families” and stakes to display on school property. 3. Two or more Neighborhood Lawn Signs “My garden feeds hungry families” for students and families to see and use to encourage participation. We will provide lawn signs to every home that donates fruit. 4. A Reproducible Neighborhood Flyer for students and their parents to distribute to neighbors if needed. 5. A Reproducible Parent Flyer explaining the Fruit Drive and the collection process. Thank you for working with GleanSLO and the Food Bank Coalition of San Luis Obispo County to feed hungry families in your community. 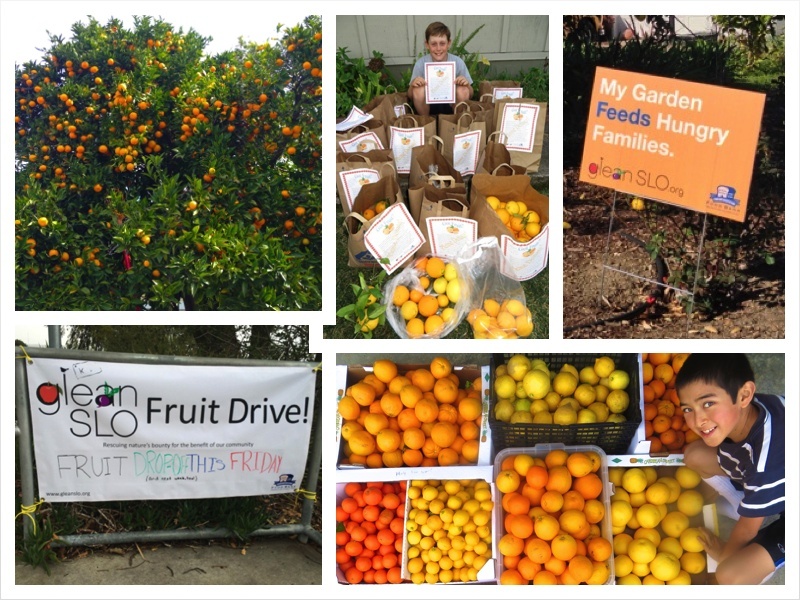 For more information or to request a Fruit Drive Kit for your school or group, please email gleanslo@slofoodbank.org or call 805-835-3750. GleanSLO would like to thank the many talented volunteers who have been a part of the development of this project, and who continue to support its growth: Carolyn, Evan, Jahan, Jeanine, Johanna, Lucy, Mavis, Michelle, Olivia, Sienna, and Stephanie. 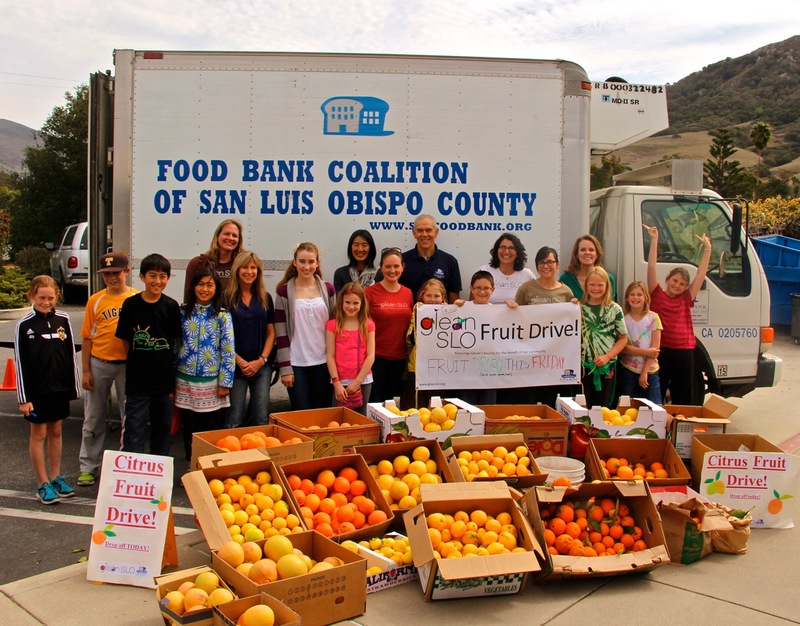 Thanks to the schools who have participated in the Fruit Drive program: Bishop’s Peak/Teach Elementary, Hawthorn, Laguna, Pacheco, Sinscheimer, and SLO High! This entry was posted in Backyard Harvests, Produce Collection, Uncategorized on 04/08/2014 by gleanslo. Local Business Promega Biosciences gets Creative with Produce! 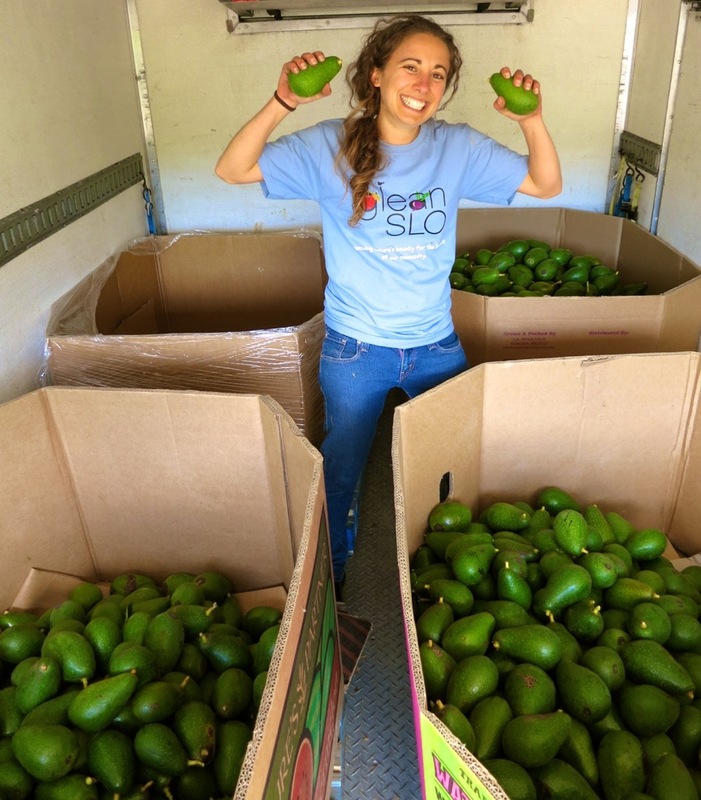 In 2013 Promega Biosciences Inc. of San Luis Obispo held their first Produce Swap! 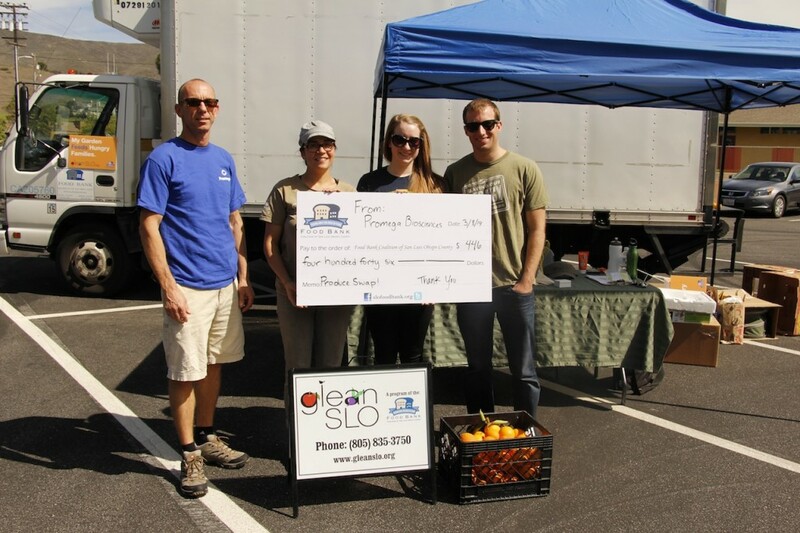 Employees brought in their homegrown produce, nuts, eggs and canned goods to trade or ‘purchase.’ The money from the ‘purchases’ were collected, matched by PBI and donated to GleanSLO at the end of the season. The total of their donation was $446! Thanks for your innovative model to keep our community healthy and thriving! This entry was posted in Donations!, Uncategorized on 04/07/2014 by gleanslo. One of my most vivid memories upon arriving in SLO was the beautiful, incredibly fruitful orange tree that stood on the side of my little home. Being from Maine, I couldn’t get over the amazing taste of the oranges and their abundance! Every meal for months involved some of those oranges, or lemons from my neighbor or persimmons from my landlord… what bounty! I remember taking walks around the neighborhood and being shocked by how much fruit was right in our backyards and yet often falling to the ground in waste. I met Carolyn Eicher through SLO Grown Kids and began to feel the momentum growing in my relatively new community around the idea of gleaning and what this could look like for SLO. Many meetings were held, ideas were thrown around, research was done, little gleans were experimented with… and then GleanSLO was birthed. What a gift to have been witness to that process. With the help and encouragement of many in the community, I applied for an Americorps position in 2011 with my time split between GleanSLO and the Food Bank. I have so many fond memories of those days and driving the Food Bank truck along HWY 1 to gleans throughout the county. From the farmers I met who opened their fields, to the dedicated volunteers who came glean after glean, the people and heart behind GleanSLO never ceased to amaze me. When I was back visiting SLO this fall, I was lucky enough to attend a strawberry glean and see how much GleanSLO has grown and yet has been able to maintain its community-centered mission and mentality. I have no doubt that GleanSLO will be a fixture in SLO for years to come bringing the community together in more ways than can be counted. This entry was posted in GleanSLO Interviews on 04/07/2014 by gleanslo. 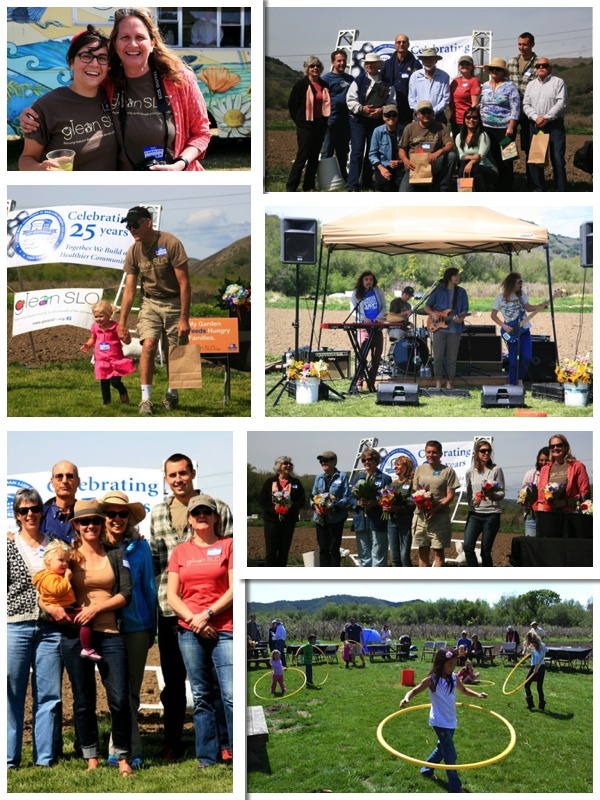 The GleanSLO Volunteer Appreciation event was held on Sunday, March 30th, at SLO Creek Farms! It was a magnificent day, and the entire apple orchard was in bloom! 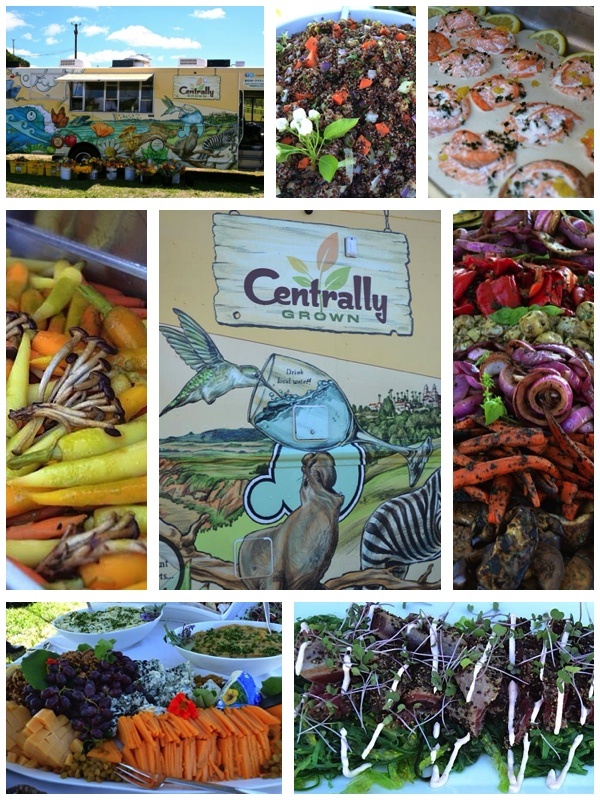 A wonderful late lunch of locally sourced food, lovingly prepared and donated to GLeanSLO by Centrally Grown in Cambria, was served. Live music from an awesome new band, Proxima Parada, enticed kids and families out onto the lawn to dance. Spring bouquets were everywhere! The sun shone, and the community that has risen around GleanSLO celebrated each other. It was a beautiful day. More photos can be found on our Flickr page. This entry was posted in Events on 04/07/2014 by gleanslo.